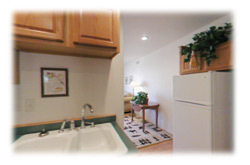 The downstairs unit is a one-bedroom suite with a kitchen and living room. 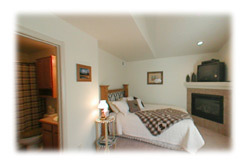 The suite is decorated with touches of pine and delicate mountain flowers providing a feel of a north woods retreat. 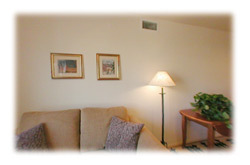 The living room is small, yet cozy, with a view of the yard and has a TV/VCR The bedroom is spacious with a sitting area. There is a corner gas fireplace as well as a TV/DVD. * No refunds for early checkout. 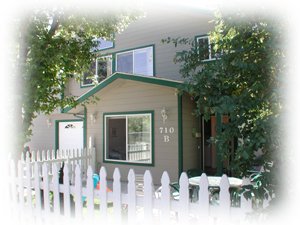 * A refund will be made only if cottage is re-rented. * Multiple night minimum may be required on weekends, holidays or special events. * Children 6 and under stay free. Grand Canyon Tours - Our guests thoroughly enjoyed their tour with AngelsGateTours.com They will stop by your cottage and pick you up and then then drop you off after the tour. For those who would rather not drive to the canyon or fight the crowds, but have an experienced guide show all the important sights as well as some that would be missed on a self-tour, check this one out!! Pioneer Museum/Arizona Historical Society Two miles from downtown Flagstaff, this compound reviews the history of our region's first white settlers. A working blacksmith and other demonstrations take place quite often. For downhill: ArizonaSnowbowl.com which has their summer activities listed also. Local Area Restaurant Menus - TheMenuPlease.com for many of our local restaurants' menus. If you just want to kick back and relax and not do the tourist thing, you can visit quaint shops, antique emporiums and great restaurants in the downtown area. And since there are over 300 days of sunshine a year in Flagstaff, many outside activities are available such as golf, tennis, hiking, mountain biking to name just a few. This cozy living room, with hard wood floors, overlooks the yard and is a relaxing spot to enjoy a glass of wine or lemonade. The pictures and colors give the room the feel of a mountain retreat. 710 W. Birch - a delightful little breakfast nook A compact and fully equipped kitchen that has everything you need to prepare a large dinner or a snack. 710 W Birch - A relaxing and intimate bedroom The spacious bedroom/sitting room , with thick carpeting, has a gas fireplace in the corner that is visible from your bed. The queen bed is decorated in creams and pastels. A down comforter is there to keep you warm on winter nights in Flagstaff. A large TV/DVD will add to your enjoyment.